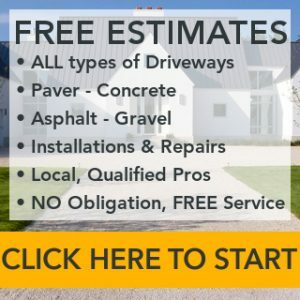 How much does a gravel driveway cost? Well, if you’re on a budget a gravel driveway is the least expensive option you can choose compared to concrete, asphalt or pavers. That said, as with every type of driveway, the final price you pay will be dictated by the amount of preparation and work to be done. Replacing an existing gravel driveway will be much cheaper than removing an old concrete driveway before laying gravel. In this driveway gravel cost guide we will look at all kinds of scenarios and tackle the factors that will affect your final estimate. 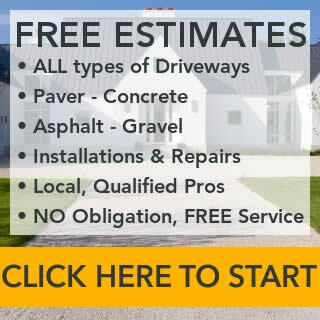 By the time you’ve read through you should be in a position to accurately estimate the cost of your gravel driveway project and be ready to get quotes from professional contractors. Here are the four most common scenarios for a gravel driveway installation project. We’ve included the steps involved and the cost of the project, from lowest to highest cost. Driveway gravel cost details are found in the next section. These are standard and average gravel driveway costs with none of the potential factors outlined below that can increase price. Let’s take a look at the scenarios above and break down the costs so you can see where your money is going. Replacing an old asphalt or concrete drive with gravel doesn’t happen often, but if that’s what you’re doing, the cost will be the highest among the scenarios. Heavy equipment is used to break up the existing material and load it into trucks. It is then hauled away for disposal or recycle/reuse. Turf and topsoil must be removed to a depth of up to 10 inches to prevent the stone and gravel from sinking into it to produce a muddy quagmire. The soil is removed with a backhoe or front-end loader and hauled away. You might want to have the removed topsoil deposited elsewhere on your property to be used for other landscaping projects. Discuss this decision and the effect it will have on cost with your driveway contractor. Premium gravel driveways are built in three layers with a total depth of 9-12 inches. If your property already has a well-drained sand or gravel base, some contractors will recommend only the top two layers or one thick top layer for a total depth of 4-8 inches. Therefore, review these costs in light of what’s lying beneath the turf on your property. Base layer: 6” stone is spread in a single layer to form a durable base that drains very well. Middle layer: 2” to 3” stone is spread to a depth of 3-4 inches. Top layer: Road gravel, crushed stone or pea stone is spread to a depth of 2-3 inches. While pea stone is considered more attractive by some homeowners, it doesn’t stay in place as well as your other options. It will gradually be scattered into your yard, and it requires more maintenance to grade and rake it. The gravel driveway costs given to this point reflect a basic installation with no variables that affect price. However, many projects include factors that raise (common) or lower (rare) the cost. Using less driveway material: As mentioned, in areas of the country where sand and gravel make up the soil, perhaps under a thin layer of topsoil, the amount of material can be significantly reduced. The exact makeup of the driveway will be determined by existing conditions, contractor recommendation and homeowner choice. Wooded property: Clearing land is expensive due to increased labor and equipment costs. The more wooded it is, the higher the price increase. Note that mature hardwoods and some softwoods have timber value that might offset the excavation costs. Contact a company that buys standing timber to discuss the possibility of selling your trees. Extra fill required: The need for extra fill arises when the driveway path has low and/or wet areas and when the fill is needed to shape or reduce the steepness of the drive. Adding drain tile or culverts: Water can quickly erode and undercut a gravel driveway, so it must be controlled. Running water should be channeled into and through drain pipes (culverts). Standing water must be addressed with drain tile using about 15 feet of tile per foot of driveway affected by it. A qualified driveway contractor might suggest a change in path for the driveway to alleviate the threat of erosion caused by running or standing water. Permits: Most counties require a permit for driveway installation. The cost includes one or more inspections to assure the driveway is built properly given the existing conditions and that water issues are properly addressed. Permits: $25 to $100 or more. Concrete curbs and gutters: In some urban and suburban communities, curbs and gutters are required at the foot of the driveway. Retaining walls: In those rare instances when a driveway path cuts through a hillside or runs to the lower level of a home with a walkout basement, retaining walls will need to be built to prevent collapse and/or erosion of soils. For example, a wall 30 feet long and 4 feet high, 120 square feet, would cost $3,000 to $4,200. It’s time to put all of this information into a realistic estimate of your gravel driveway cost. 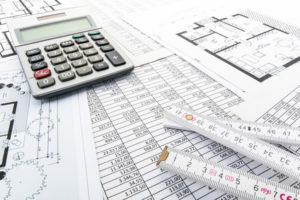 Working up an estimate now will assist you in being an informed homeowner as you discuss your project with contractors and will be much more accurate than any online gravel driveway cost calculator. Perhaps this example of a recent driveway installation will assist you in calculating the estimate for your project. This driveway is a good representation of the majority of gravel drives. The home is in Dawsonville, Georgia. It is built on land that was once farmland, but only used for hunting in the last 20 years. Light woods had grown up that needed to be removed in the driveway path. The soil averages 6-8 inches of sandy loam topsoil with similar soils beneath. Driveway excavation and preparation: Ten inches of existing soil were excavated and dumped to the side to be shaped into a privacy berm later. A moderate number of saplings and small trees up to 1.5” diameter were bulldozed out as part of the excavation. The bed was graded, and a culvert was placed in the ditch at the road and covered with 10 cubic yards of gravel. Sixty feet of drain tile was installed to drain water from a low spot into a small creek. Material installation: The distance to the gravel pit is about 8 miles away, so there were no extra trucking costs. Gas cost was $2.39/gallon at the time. In the final analysis, this driveway came out slightly higher than the top end of the standard cost, which we gave as $2.85 per square foot. The reason is that all three layers of material were installed, the materials were priced near the upper limits, and the culvert and drain tile were extra expenses. Online gravel driveway estimates vary widely because most do not consider all of the potential factors. This guide to asphalt driveway costs takes into account all possible scenarios and the impact they have on the price you’ll pay. We expect the estimate you work up for your project will be within the range of asphalt driveway estimates you receive. Whether it is or isn’t, let us know about your project and its cost, so that we can continue to fine-tune our price estimates. Before you choose a contractor, get at least three written estimates. Let each contractor know that you will be comparing quotes with other companies, but that you want quality materials and workmanship for your driveway. This strategy will produce competitive estimates for a driveway that will be durable in the years to come. If you want to vet the contractors more closely, ask for references and call them. Ask for the address of driveways installed 3-5 years ago, and drive by them. Problems to look for are erosion, deep ruts and standing water on or near the drive. Weeds in the driveway are a result of poor maintenance and do not reflect on the quality of the installation. There are several periodic maintenance tasks that will keep your driveway looking good and performing as it should. With this type of periodic maintenance, a gravel driveway will last indefinitely, making it a cost-effective choice in the years ahead.